King George Lodge #59 G.R.A. A.F. & A.M when constituted met in Riley Hall, which was little more than a loft over a store, situated at the corner of Fifth Avenue Northwest and Eleventh Street. These were temporary quarters until such time as the Ross Block, corner of Tenth Street and Center Avenue Northwest should be finished, in which building Mr. William Ross, the owner, was providing a public hall. On moving into these premises on September 29, 1911, King George Lodge leased the hall and became landlord to the numerous sub tenants occupying it. 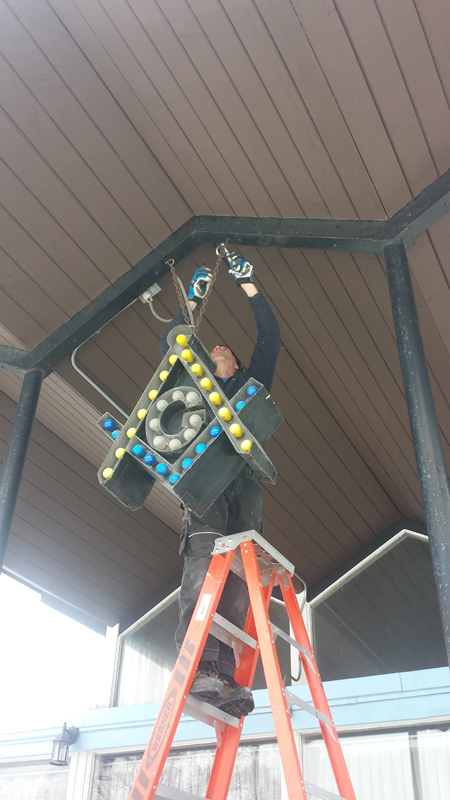 The sub tenants have consisted at various times of Independent Order of Odd Fellows, Rebeocah, Encampment, Royal Arch Chapter of Masons, Order of the Eastern Star, Loyal Orange Lodge, and others. As time went on it become increasingly apparent the premises were unsatisfactory as a public hall. The ante-rooms and locker space were entirely inadequate, the banquet room unsuitable, while the low ceiling in the Lodge room itself made it impossible to properly ventilate the room, particularly with a fairly large gathering. These short-comings were noted from the beginning sofrom the earliest moment the idea of some day erecting a Masonic Temple in this part of the city was cherished by the membership. However, the small number of members in the early years together with the outbreak of the Great War in August 1914 dispelled any possibility of a temple until demobilization took place and with it the great influx of new members into the order. The first active steps were taken in April 1920 during the term of Worshipful Brother V.H. Macaulay as Master. At this time prosperity prevailed but it was the period of post-war inflation when prices were unreasonably high and at the moment was out of the question. However, the whole matter was carefully considered and it was felt that as the city was selling land for arrears of taxes that the moment had arrived for securing a site. The only lots in this neighbourhood so offered were certain unsuitable ones on the boulevard. Advice was received that if the Lodge waited another year certain more choice lots would become available. Thus it was that on April 16, 1921 lots seven and eight of the present site were secured from the City of Calgary. Worshipful Brother J. Brown was then master and under his leadership committees were formed to proceed with a canvas for subscriptions to consider tentative plans and in general prosecute the idea of building. What is known as the Building Fund dates from this time. Unfortunately the response to the canvas was not as generous as the needs required, owing to the fact that deflation following the post-war conditions had now set it and unemployment was general. The following year with Worshipful Brother W.C. Black in the chair, the scheme was kept alive by following up the pledges and little by little funds were accumulated. In 1923 Worshipful Brother W. Ferguson had a ways and means committee formed which was successful in augmenting the building fund considerably by holding teas, whist drives, and so on. An endeavour to finance the proposition on a basis of brethren making a loan without interest of fifty dollars per member was put before a special meeting June 19, 1923 but failed to carry. 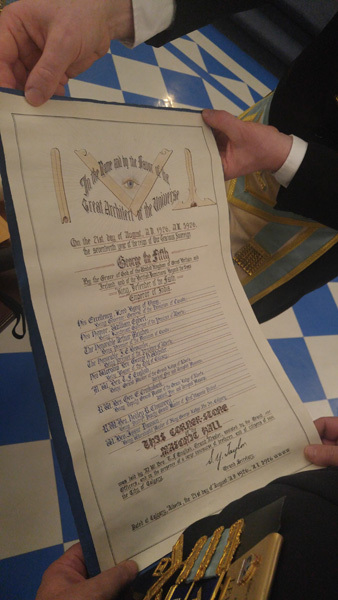 In August 1924 it was necessary for Worshipful Brother A. Davison as Worshipful Master, to renew the lease for another two years as we were not yet in a position to build. Early in 1925 Worshipful Brother F.L. Jones, realized a hall must be erected at the expiration of the present lease. New committees were formed. Sometime in April 1925 the proposition of purchasing the unused Congregational Church corner of 12 Street and 12 Avenue was considered and while it met with considerable favour it was finally voted down as it would mean a removal of the Lodge from the community of Hillhurst. Brother Isaac Dawson, Senior Warden, assumed the chairmanship of the building committee and to him belongs a great deal of the credit for the success of the lodge's venture. True he received the hearty cooperation of all, and to mention the names of those who have so ably assisted him would include most of the active members. Immediately a campaign for completing the canvas for subscriptions was inaugurated and followed up through the fall and winter months. When Brother Isaac Dawson became Worshipful Master in December 1925 the chairmanship of the Building Committee was assumed by Brother D.R. Montgomery, Senior Warden. The following were the other members of that committee, Worshipful Brother W. Fleet, Worshipful Brother W.J Broughton, Brother H.P. Baunders and Worshipful Brother Isaac Dawson and Brother T.B. Donald secretary. To them was entrusted the responsibility of having plans prepared by a suitable architect, also to bring in a report to the Lodge as to the proposed cost of the new temple, its financing and maintenance. Their report and the plans prepared by Brother D.S Mollroy, architect, were considered at a special meeting of the Lodge on June 4, 1926 and enthusiastically adopted by the Brethren. It was at this time considered advisable to purchase an additional lot adjoining in order that our building might be suitably situated on 75 feet. Accordingly, lot 9 was purchased from the City of Calgary. The architect was commissioned to complete the plans and call for tenders. The contract was finally let to the Sunnyside Construction Company of Calgary on July 13, 1926. Building operations were commenced on Tuesday, August 3, 1926. In late 1984 the Senior Officers of the Lodge and some other Lodge members were constituted into a Temple Committee. The scope of their reference was to make recommendations to the Lodge about our situation in the Hillhurst District. In January of 1985 the committee reported to the Lodge. In part they informed the Lodge renovation to the existing building was not advisable due to the high cost of such work. The recommendation was to sell at a fair and satisfactory price and locate elsewhere. At a special Emergent Meeting of February 27, 1985 the Lodge entertained a motion to sell the Lodge real estate in Kensington, the motion was duly passed by the Lodge. The Temple Committee then made a slide presentation to the Lodge about the Bethany Chapel. They reported that it proved to be the most suitable location and facility for our needs. An offer was to be presented to the present owners of the property. On April the 28 the Temple Committee reported that our offer to purchase the above property had been accepted. Plans then were formulated for the removal from our home of the last 59 years. At the regular Communication of the Lodge a motion was made and passed that the Lodge sell the floor tiles of the Mosaic Floor at $10 each and the chairs in the new Lodge Room at $100 each. This to be in Honour of our Seventy-fifth Anniversary. It was stated that the chairs will have a brass plaque attached so that the donation may be in memory of any desired mason or simply donated by whom ever. Direction was made that the corner stone be removed and re-engraved for use at our new location. An extra-ordinary Emergent Meeting was held on May 25 with a luncheon served at 12 noon. The purpose of the meeting was the removing of the corner stone which had been installed almost 60 years ago. The Worshipful Master opened the Lodge at 1:30 P.M. The visitors were then conducted into the Lodge in form and greeted by the members of King George. They represented sixteen different lodges from as far away as Rheindahlen West Germany. The Grand Lodge Officers were then brought into the Lodge in form. In number they totaled ten and we were most fortunate to have with us the Deputy Grand Master Rt. Wor. Bro. W. Graves and the Grand Secretary, Rt. Wor. Bro. A. F. Aylesworth, along with many other worthy members of our Grand Lodge. A memorial service was then conducted by Wor. Bro. J. B. Cooke, in memory of all those masons who had sat in this Lodge during the past sixty years. A History of the Lodge was then read by Bro. D. M. R. McKay. This paper had been prepared and read by the V. Wor. Bro. Flett to a meeting of the lodge in 1953. At this time he was 76 years old. Of interest in the fact that at that time V. Wor. Bro. Flett was the last surviving charter member of the Lodge. Instructions were then given to the workmen to retire from the Lodge and remove the corner stone. 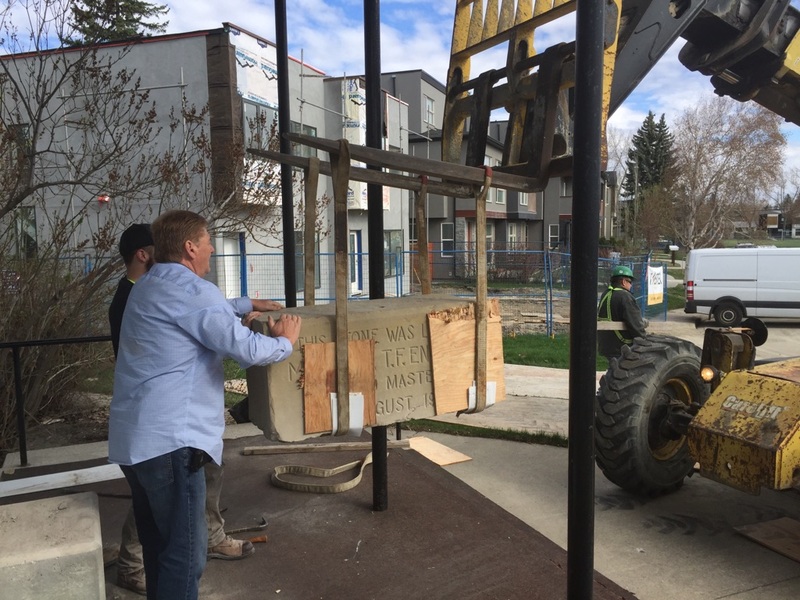 This task proved very interesting in as much as the stone weighs the best part of 1500 pounds. Wor. Bro. L. King then presented two papers to the Lodge. 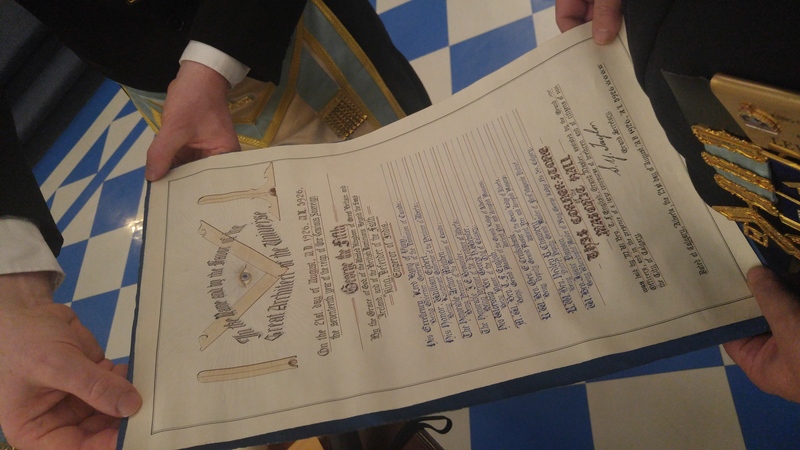 The first being the proclamation of the Most Worshipful the Grand Lodge of Alberta that the corner stone was well and truly laid, the second the speech of Most Wor. Bro. T.F. English the Grand Master at the laying of the corner stone in August of 1926. Wor. Bro. S. Clayton then presented a series of historical slides dating back to the early years of the Lodge. Rt. Wor. Bro. G. Perry then carried out the dedication service of the picture of the Officers of the Lodge sitting in 1926 when the-building was erected. Wor. Bro. B. Snyder then was given the task of opening the time capsule which was laid when the stone was first put in place. 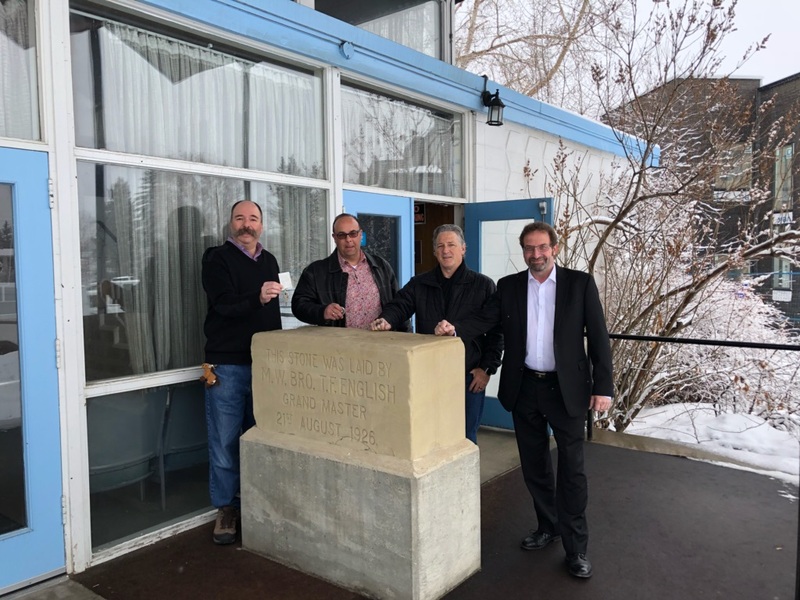 The Lodge received the keys to the new building in late July and there were in excess of 5000 man hours go into the preparation of the new Lodge Room.This was conducted by many dedicated members of our Lodge and members of our renters organizations. The first meeting of the Lodge took place in the new building on Sept. 13, 1985. In about 2015 members of the board of King George Masonic Temple Inc., which owns and operates the building, came to the conclusion continued existence at the Osborne building was unsustainable. The City of Calgary had increased the property taxes over 100% overnight and maintenance of the 60 year old building was becoming a financial burden. Steps were taken to increase the revenue of the building, but at best that was a stop gap measure. Executive members Chair Dave Murray, Treasurer Steve Kennard, Board Secretary Sean Yost and Facility Manager Roger Matas, approached the board and asked for authority to pursue the sale of the building and the purchase of a new location. Approval was granted and that started a three year roller-coaster. The four were given autonomy by the board to complete the transactions with the board having oversight. The building was sold and an offer accepted on a new building. Just before the deal was to finalize the purchasers of Osborne pulled out which ended both deals. In May 2017 another potential purchaser came forward and the search started afresh for a new location. The executive set several criteria for a new location including, obviously, its location, but also financial sustainability including a reliable revenue stream and lower taxes. The decision was made to look for premises in a more industrial area to reduce the tax burden. 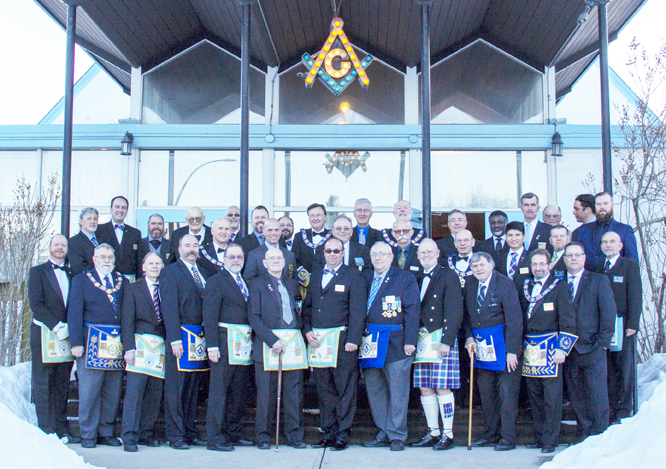 The last meeting of King George Lodge took place at the Osborne site on March 23, 2018 with the Grand Master and other senior officers in attendance (photo right). See photos from the move here. The lodge moved into temporary quarters at Freemasons' Hall in downtown Calgary until the new hall was completed. Also at right, the historic square and compass comes down from the Osborne location. It was created by a member of King George Lodge probably 100 years ago. It graced a lodge hall in downtown Calgary for many years, moved to King George's Kensington location and then was relocated to the Osborne property. It will be refurbished and take up a prominent location in the lobby of the new building. On April 16, 2018, King George Masonic Temple Inc. turned over the keys to the Osborne premises to its new owners. At left the board's executive stand in front of the cornerstone which was first laid in 1926. The corner stone was removed on May 8, 2018. It will accompany King George Lodge to its new home. 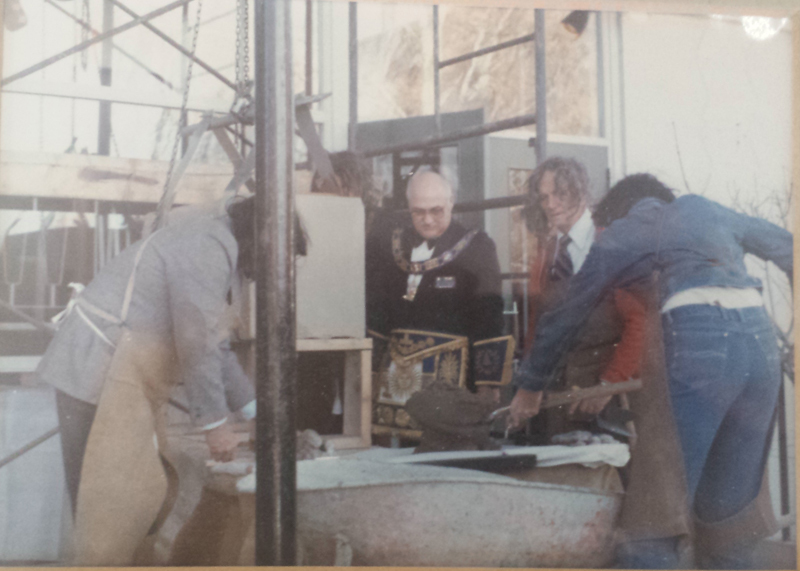 On May 11, 2018, at the regular meeting of King George Lodge, a time capsule, which had been embedded under the cornerstone at the front of the building in 1985 was opened and the contents displayed for the members. Right Worshipful Brother Lew King and Worshipful Brother Eric Bumstead, who were at the laying of the cornerstone in 1985, were present, along with Worshipful Master Sean Yost. More photos from the time capsule are available here. To find out more about King George Hall including photos of the construction see the hall website here.